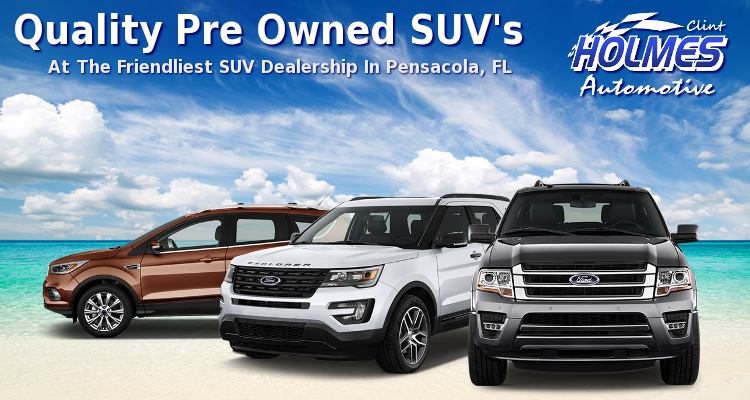 Every pre owned SUV in stock at Clint Holmes Automotive in Pensacola meets or exceeds the average expectations of condition, safety, value and reliability. Most of our SUV’s for sale are late model vehicles with low mileage and are priced below retail book value. We sell several different popular makes and models so our inventory has something to offer every shopper. Your family’s wants and needs are our first priority and those are the only factors we consider when purchasing our pre owned SUV’s. After you have found the right vehicle in our inventory, contact us to schedule a test drive and we will gladly assist you with the rest of your purchase process. Sport Utility Vehicles are the most versatile automobile made. From Crossovers to Off Road editions, there’s a purpose built SUV for everyone. With endless makes, models and trim packages on the market, finding the right pre owned SUV for sale can be a frustrating task. Most SUV’s are generally used for family vehicles so comfort, functionality and safety are the main ingredients that consumers look for. Some car buyers may shop for full size SUV’s with 3rd row seats and V8 towing capabilities while others may be looking for a mid size SUV with good gas mileage and minimum maintenance intervals. At Clint Holmes Automotive in Pensacola, we take pride in the way we do business. We focus 100% on our customers and believe car-buying should be a fun, hassle-free experience! Come take a test drive at the friendliest local car dealership in town.